There is this concept in theatre, the Fourth Wall. The idea is a theatre set has 3 walls, with one missing so we can watch the play. To characters in the play there are 4 walls as the audience don’t exist. To the audience the 4th wall is invisible, so they can see events in the play. When a character (not actor) addresses the audience, they break this ‘4th wall’ going all meta… So ‘breaking the Fourth Wall’ has come to mean the acknowledgement of the audience within a media form. In films that can mean the character addressing the viewer. 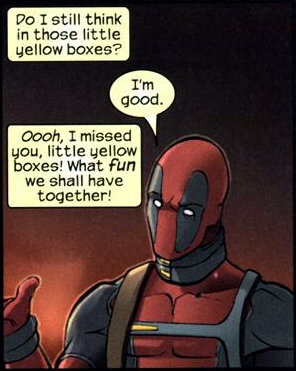 In comics it can mean acknowledging that the character is in a static world of text and images (Deadpool is especially well know for this). Video games also play with this concept. I’ve picked four examples of this I think are really clever. This is one of my favourite games of all time. There is so much good stuff going on here. It is a brilliant example of game design; it created it’s own genre (stealth ’em up) and had an amazing array of interactions to drive home the gameplay. (That is perhaps a topic for another post…) What the game also does is break the Forth Wall. For example when you are fighting the boss Psycho Mantis, he seems to be able to counter your every move. He’s a psychic boss, so measures to counter that are needed. What emerges is that you can swap the controller from Port 1 to Port 2 – as he’s only reading the input from Port 1. This means the characters in the game acknowledge the existence of the player and that they are trapped within a game. So cool! The best thing about this game, IMHO, is the narrative – it is great fun. Early on we see this at play as the main character (Cthulhu) breaks the Fourth Wall by reading the narrators titles to figure out what he has to do next. In the video below you can see this at 2.20. This is a great game. Really amazing and well worth playing. I came across this via the film Indie Game: The Movie. The game is about at 2D character that realises he is within a 3D world. What is so brilliant is how the games explains this too you; once the revelation of the 3rd dimension hits you, the game appears to crash and re-boot and so places you back in the same place you were before – except now you can control that 3rd dimension, and in the process, breaks the Fourth Wall. Amazing. I just downloaded this SEGA classic the other day. It’s about a comic creator who get trapped within the pages of his own comic. The whole premise of the game is about the Fourth Wall. We see the evil cartoonist drawing in new enemies for you to fight, we see comic panels broken… Really great stuff!